My destination, a place called the Freedom Theatre, adjoined a refugee camp that was completely flattened by made-in-the-USA Israeli bulldozers during the Second Intifada. On the walls of buildings all over town were posters celebrating young men with big guns. At the time, one of the Freedom Theatre’s founders, Zakaria Zubeidi, was sitting in a Palestinian Authority jail with no formal charge. Before turning to theatrical resistance, he had been the local commander of the Al-Aqsa Martyrs’ Brigades, which for a time put him at number one on Israel’s most-wanted list. A year earlier, a gunman murdered the Freedom Theatre’s half-Israeli co-founder, Juliano Mer-Khamis, in the courtyard where the final taxi dropped me off. I had come for the inaugural tour of the Freedom Bus, a 10-day sequence of performances across the West Bank. The other internationals along for the ride made for a varied group, the main factions being college students from the United States and retirees associated with the Swedish National Touring Theatre. The first night at our lonely hotel in Jenin, fatigue led me to fantasies of escape, of hiding back across the Green Line in Israel-proper, where for the previous day the half-Jew in me had felt the rare and guilty pleasure of being among my own. For this tour, Freedom Theatre actors employed a method known as Playback Theatre — sort of a stepchild to Rogerian psychotherapy and sibling to Theatre of the Oppressed. The basic model involves an audience member telling a story from her or his life, which then the actors spin into an improvised skit. This process is supposed to honor the unsung experiences of ordinary people while inserting them into the collective lore of the community. 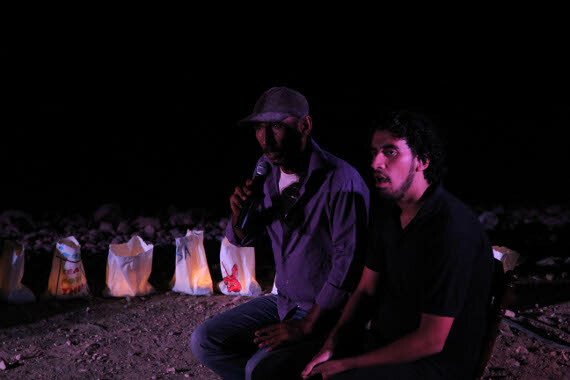 In Nablus, actors performed outside a home that had been bulldozed, crushing family members from three generations inside. The night we were at Nabi Saleh, a teenager arrived back from two weeks in an Israeli jail, and his friends honked car horns and shot off fireworks as his story became a Playback skit. There, for years without stopping, the villagers have marched every Friday to protest the confiscation of their land and their water. After the Playback, a group of children sang a song to Musfata Tamimi, who’d been killed a few months earlier by a tear-gas canister that hit him in the face. 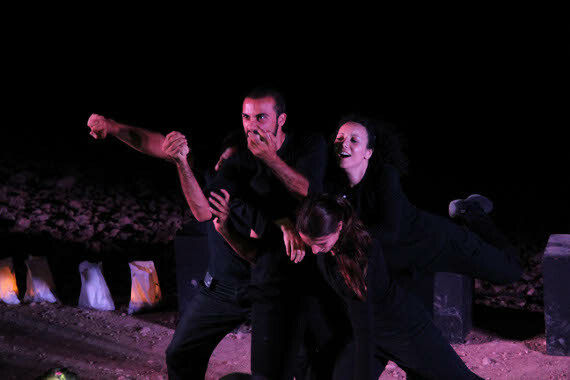 In Al-Walajah, the performance was at a house encircled by Israeli walls. We helped put out a brush fire with blankets and shovels on a parched hillside near Beit Omar. 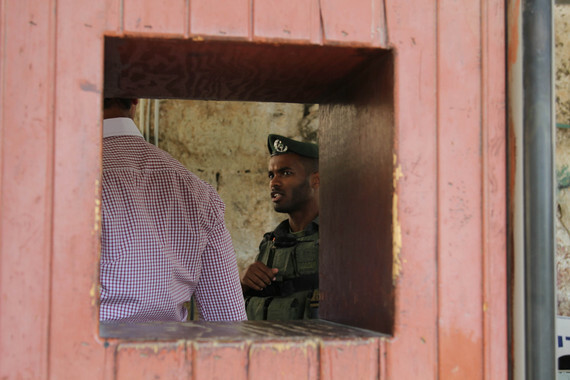 In the old city of Hebron, which has 500 or so Jewish settlers living in its central artery — guarded by 2,000 soldiers — the kids were so restless and stir crazy that we had to end and pack up early. One night the show was at a Bedouin camp tucked beside a highway, a place that was as foreign to the actors from places like Jenin and East Jerusalem as to the Swedes. We saw more of the West Bank than most of its inhabitants have. Traveling means paying fuel prices few can afford, hours stopped at checkpoints, and the risk of arbitrary search and seizure. Common to each place we went were the stories of arrests, of detainment, of night raids, of settler attacks. The tellers tended to speak matter-of-factly, in a tone of voice dulled to the terror and misery of the contents. The actors took it on themselves to reclaim that feeling, to contort their faces in expressions as unmistakable and unforgettable as they could manage. The skits usually ended on a note of defiance, whether it was in the original story or not, with a patriotic song or the recitation of a Mahmoud Darwish poem. Our translator, whom we internationals listened to through wireless headsets, rendered the most often-sung song as having to do with making barbecue from the fire in one’s heart. A moon base is, essentially, the perfect suburb. In contrast to its hostile surroundings, it is supposed to be clean, orderly, functional and white. Every inch is planned. Its inhabitants work together for a higher purpose. I imagine that life in the matching apartment buildings and townhouses and houses of the settlements is like that too. I imagine that there are a lot of recycling bins. This is possible. These are proven methods for subjugating a people and taking over a territory. They’ve worked in many times and places, and in Palestine they’re working now. The military occupation over that tiny patch of land only makes more explicit than usual the kind of subjugation that elsewhere goes by other names. The arbitrary imprisonment that was so common among Palestinian boys we met reminded me of Mike, who has lived in my building in Brooklyn all his life, who didn’t come by for guitar lessons for a few months because he’d been locked up for doing the same stuff other kids in other places do but without much chance of consequences. Some people, because they are in the way of something valuable, are born suspects, guilty before they have a chance to be innocent. They paint graffiti on the walls to insist that their home is really theirs and kill each other to insist to themselves that they’re really still alive. We know this; this is familiar. We call it stop-and-frisk or eminent domain. It should come as no surprise that the NYPD has been learning combat and surveillance tactics from Israeli troops in the West Bank, and it now has its own office in Israel. In a room resembling the bridge of a starship we met with PalTel’s CEO. Unlike any of the villagers and activists and artists we heard from, he spoke as if a viable Palestinian state huddled alongside Israel were still a practical ambition. “We are capitalists!” he assured us, tugging with both hands at the lapels of his suit jacket. “All we are concerned about is making money.” He spoke of a future in which Ramallah would be like New York. He thought that would please us. Such talk has appeal for some young Palestinians, those less attached to their grandparents’ skeleton keys and the dream of Return. Like children of neoliberalism everywhere, they seem disturbingly well-adjusted to the way of things, with an instinct for turning oppression into a business opportunity. They ask, before even knowing your name, if they can be your friend on Facebook. But there are also others among the youth: the ones responsible for the burning tires and dumpsters we passed by on the road out of Ramallah, calling for the downfall of Texas-educated Prime Minister Salam Fayyad. Wherever I went in the West Bank, my country was lurking in the background — framing the choices, making a little more bearable the slow dissolution of this society for those enduring it, and thereby making it possible at all. Along roads and among the crumbling old sections of towns, there were reminders of our handiwork: “Funded by the people of the United States of America for the benefit of the Palestinian people.” No such signs appeared on the Israeli soldiers’ rifles. There are so many words to learn, and to learn how to use correctly, depending on whom you’re talking to. I’ve been saying “West Bank,” for instance, but Israel’s prime minister refers to the same territory in biblical terms: “Judea and Samaria.” What other words are landmines? 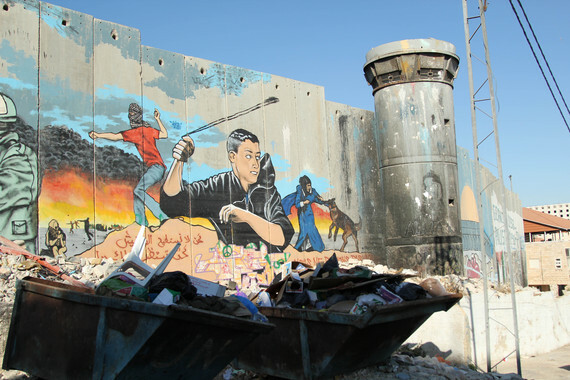 Is there a “security fence” or a “separation wall,” or a “segregation wall” or an “apartheid wall”? The towering concrete barriers and the settlements and the Israeli “Defense” Forces’ checkpoints are “facts on the ground.” When Palestinians can’t stand to name the country that took their land, they call it “’48,” after the year of the taking. This is a practice in “steadfastness,” in “popular resistance,” in preventing one’s own “normalization” to the presence of the colonizer. If “peace” and “conflict” were really the issue, this could sound like commendable realism. But when expansion and dismemberment are the facts on the ground, the unstated “something” to which he knowingly refers, and which we only need to “live with” a few generations longer before it “ultimately” concludes, these same words become monstrous. There was a woman on the Freedom Bus, a middle-aged social worker from New York, who wanted to see Playback Theatre of this sort practiced by Israelis and Palestinians together, sharing their stories and thereby learning to coexist. She reported to me at one point, however, that she’d asked one of the actors about this idea, and the actor was not interested. The Palestinian-American literary critic Edward Said once observed of the many polite dialogues he participated in that, “as the weaker, less organized party, the Palestinians could not really benefit from the uneven exchange.” Under occupation, the likely effect of such productions is the further pacification of the losing side. The activists we talked with in the West Bank asked not for dialogue, but for more bodies at protests, and more boycotts, divestments and sanctions against the occupation. I never actually went inside a settlement; our Freedom Bus’s green plates prevented it from going to one, though my own privilege would have allowed me to do so after the tour was over. I don’t pretend that what I saw could count as a complete picture, or even a fair summary of one. I would feel cautious about taking sides if there were any sides left to take after the settlements and the bewildering course of the wall. The situation is complex, but it’s also simple. 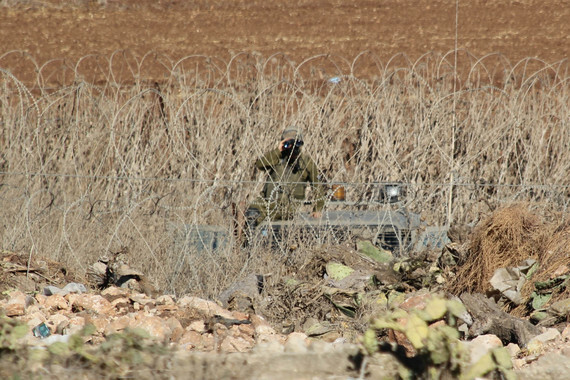 There is no doubt of who is building the wall or who is guarding the settlements. And what’s Jewish in me knows that the measure of justice is the purview of the weak — the widows, the orphans, the exiles, even the insurgents. Prophets never bring good news for kings. It amazed me how much people in the West Bank complain about each other’s apathy and inaction. The complaints reminded me of activists at home, but the circumstances did not. This was a society with a single, undisputed problem, which just about every woman, man and child had resisted and suffered for doing so. While many of us till the field of our compassion so as to carry on in whatever happens to be our cause, the Palestinians’ “issue,” as they often refer to it in English, is reinforced and clarified by the geography they inhabit day after day. It’s in every roadblock and water shortage and bulldozed house and unaffordable liter of fuel. People deem it obviously pathetic that only a handful of villages mount weekly protests against the latest Israeli incursion by wall and by settlers — again and again for years on end, with whole families risking tear gas and bullets each time. Yet through the great waves of resistance and through lulls like the present, their situation only worsens. At the end of the journey, our guide, tired and under the weather, muttered, “We are running out of time.” He spoke of his own activism in the past tense — and of his society in almost that way, too. The West Bank is an hourglass in more respects than its shape. You can watch the land disappearing before you, slowly but perceptibly. Space leads to time. The night before my flight home, staying at an old convent in Jerusalem, I photographed all the pages of my notebook, transferred them from my laptop to the Internet and threw the notebook in the trash. I uploaded and removed all the pictures on my camera except those of holy places. All that was left in my suitcase were clothes, small ceramics, and an old Bible its pages marked at the various conquests of Jerusalem. I’d slept badly every night of the trip, my head worrying about what would happen on the way out at the airport and how to avoid whatever it was. One of the students on the trip had already been taken out of her wheelchair and strip-searched there the night before. Perhaps they got to see the Hebrew letters tattooed along her ribs. “Do you know Ivrit?” she asked, using the word for Hebrew in Hebrew that most people who don’t know Hebrew don’t know. “I studied it for a year in college,” I replied. It was ancient Hebrew; I can read the letters and translate archaic grammar, but I can’t speak a word. She went off to her superiors for a few moments, and then opened the barrier and let me go through to get my boarding pass. No further questions. This article appears through a collaboration with Killing the Buddha and is also published there. The best thing Americans can do right now to support the Palestinians is to build the international campaign to Boycott, Divest and Sanction Israel. BDS all the way!!! Hi Ho! This was certainly the message that I got from just about every activist I met on the West Bank. There was a tremendous amount of enthusiasm for the model of South Africa and an international divestment campaign. Thanks for mentioning this. The knee-jerk reactions from the Israeli establishment is a clear indication of how sensitive an issue this is, AND how vulnerable Israel and its lobby is to such a powerful campaign. More power to BDS! Right On! Yes, I know all this. Including the episode at the airport. I have done it too. Went to Jenin, Ramallah… To the Freedom Theater, and all that. I have an old oleh hadash ID card, written by hand. It was made some 30 years ago, before computers existed… They thought it was funny at the airport. We lived 3 years in Israel, in Ein Kerem, an old Arab village near Jerusalem. In an old Arab house which we rented from its Israeli ‘owner’ who had simply appropriated it… 25 years later, I went back to Ein Kerem. I couldn’t find the old Arab house where we had lived. I didn’t recognize the neighborhood. The old professional school there had also disappeared. There were new villas inhabited by Israeli yuppies. At the main square, I ate in an old building transformed into a nice-looking restaurant. The food was good, the service friendly… But as I left, I couldn’t help thinking: the whole thing is a crime, and perhaps a sin. They stole it. Impunity, of course, is the privilege of the strong. But, If there is Justice, there may be a price to pay some day. Who knows when. Too bad. I was sad when I left. I knew I would never go back. Thank you for a compelling description of a journey with the role of the Freedom Theater today, and by the fact you could also lay out your own personal set of issues without banishing everyone there to mere background and exotic supporting actors. I still find myself naively surprised to know, for example, NYPD has an office in Israel. These are the kinds of facts that promise there will be no way back from Israel’s special U.S. relationship. Certainly the Presidential elections have shown what to expect. That doesn’t mean there aren’t options regarding resistance such as BDS. But there are amazingly complex issues at work as you see when you visit, for example, Ramallah. From what I gathered, most frustratingly, the education level has dropped at certain levels, and Palestinian students were always known for having been well-educated in spite of the situation. Your text offers much to discuss, but I can’t help to add a juxtaposition between the unique, intellectual and challenged-by-all-sides populist Freedom Theater model (which isn’t comfortably allowed in the U.S.) to “Homeland” – the latest chapter of securitainment and a US tv hit. The well-funded p.r. repeats how this is an Israeli television program that succeeds in the U.S. and how alike therefore we are. As if there are no connections between Hollywood and Israel, or if it wasn’t simply an American script-cousin of “24”, reworking it in Israel. But when that series went to shoot in Beirut airport the script showed its true colors, set as if in the fantasy stuck in the Israeli 1980s mindset. I can’t imagine the reverse, showing a Palestinian mindest about Tel Aviv airport, etc.. without significant reprecussions. Yet, as I grew up in 60s America, the model of the Freedom Theater would have been more correctly identified with, to show how alike our values are. I say this regarding the loss of cultural identity to a sense of geopolitical national identity applied to us and coerced out of fear to reject it. The “natural” idea of NYPD office in Israel becomes our cultural expression of where our local law-enforcement extends to. We don’t reflect on the well-funded US / Israeli financing of profiling + shaping narratives in culture ( the list is ridiculous, whether AIPAC, software recognition, campus watch groups, ad infinitum in movies and television, and ultimately over what is the meaning of borders, controls and definitions of our very movments as legitimate or not) and in the end we live in a system being led to misidentify or be warned of the consequences. The possibilities are obvious, though, in what you describe as very basic realities the Freedom Theater works to address: the specific population by which it then also works with together by way of an interesting sense of practice, in this case reflectng back their stories through a method that itself also belongs to a kind of artistic practice. All of which is to be respected. The rest of your journey I’ve easily recognized from experiences, from friends and myself having travelled there. Unfortunately. Thanks for this, Nathan. I spent three weeks in the West Bank (mostly Hebron area) during the first Intifadah. So sad to hear how much more hopeless things seem. I was struck by your image of uploading your notes and photos. I was there before smart phones and took my notes in code. My biggest fear the whole time was that they’d take my camera and arrest the people in my photos. Interpersonal relations were better in the Bay Area where no clear-cut majority existed. In the outback of Nevada, I could say the same as you, but don’t, for “my own kind” are more cruel towards each other than I’ve ever known. There are racists here, and their hatreds get channeled towards each other too. My own? I don’t know what that could be.